Here it is! The song list you've been waiting for! We are so excited to be singing such a wonderful mix of old and new carols! Included are brand-new arrangements of both traditional favourites and rare Xmas treats. Canadian compositions featured are Mark Sirett's "Thou Shalt Know Him When He Comes", and Pierre Massie's bilingual carol "A Baby is Born / L’Enfant est né" - written to commemorate both the Caroller's 40th year and Canada's 150th birthday in 2017. Canadian arrangements you will hear are Terry Brynaert's "Sans Day Carol", David Rain's "In natali Domini" and many others by our director Pierre Massie. Original Canadian compositions and arrangements are noted in RED. Here is a teaser playlist of some of the carols you will hear. Enjoy! Pierre Massie started our a cappella choir in 1977 while a music student at Ottawa University. 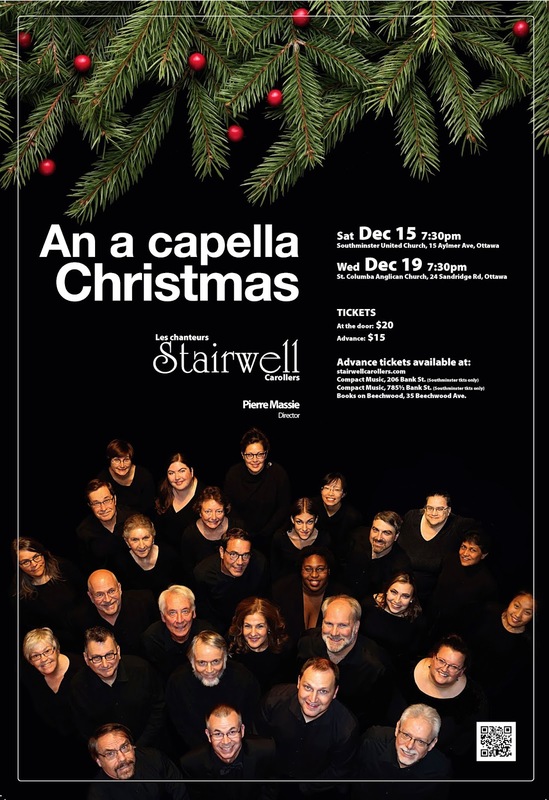 The Stairwell Carollers are ranked among the best of Ontario choirs, winning both the 2010 and 2013 Ontario Music Festival Association competitions.